A departure lounge at Cornwall's airport is to be renamed after a BBC Radio 1 DJ following a campaign by presenter Scott Mills. Newquay Airport has decided to rename its departure lounge after popular DJ Jo Whiley. No one from Newquay Airport was available for comment but Radio 1 confirmed the news on their website. A county council web poll showed that 84% of voters were in favour of naming Newquay Airport after the Radio 1 star. Blackpool International Airport has already announced it has named a Boeing 737 jet after Ms Whiley. The BBC statement said: "Scott Mills has been campaigning to get Blackpool Airport renamed to Jo Whiley International Airport. 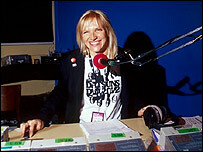 "On Thursday, Newquay Airport said it would hold a meeting to decide if it should name itself after Jo Whiley. "Soon passengers will be able to put their feet up in the Jo Whiley Departure Lounge." The council is in a race against time to raise £21m to upgrade Newquay Airport when the RAF pulls out of St Mawgan next year. 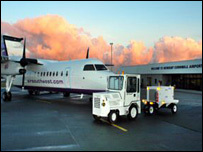 It will have to provide air traffic control, radar and firefighters in order to keep its licence. It introduced a £5 departure tax last year to help stem losses of £1m a year, but has warned that the airport may not break even until it attracts more than 600,000 passengers a year - about double its current number.